by Sydney Fish Market since 2014. 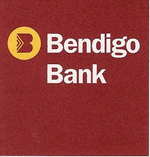 Pyrmont Bendigo Community Bank has been a wonderful supporter of the HCSF and on two occasions, presented the HCSF cheques for S1,000 and $500 to support year 6 students from Ultimo Public School as they enter High School. 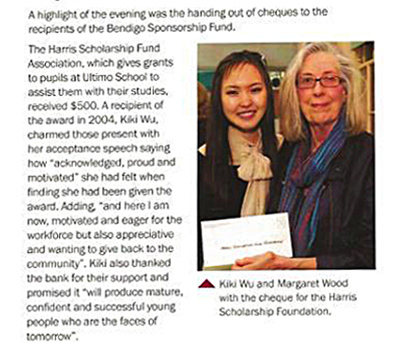 Kiki Wu, a HCSF recipient in Year 10, attended the Bendigo Bank Sponsorship Fund evening and with Margaret Wood, President of the HCSF accepted a cheque for $500. Cathy Horan, Secretary of the HCSF, was delighted to accept a cheque for $1,000 to assist Harris Community Scholarship holders to meet the costs of text books and additional expenses such as camps, school fees and uniforms. 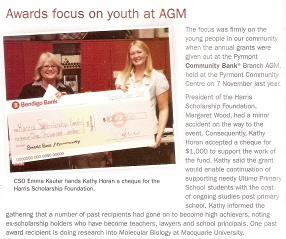 Each time a scholarship holder recieves their annual award money over a period of 9-12 years, they are reminded of their talents and involvement in Community activities. The Harris Community Scholarship is given to those students in year 6 at Ultimo Public School for their engagement with the school curriculum, as well as their ability to help others in their community. Let us know in the space below how you would like to be involved in the HCSF which has been supporting young students for over 22 years. You may like to consider a donation of money to assist in the growth of the scholarship payments, as the cost of living and education rises.